We knew Facebook had something new planned for its News Feed, and today at an event at Facebook HQ in Menlo Park, the company confirmed those rumors. As suspected, the new feed filters content by type to display whatever specific feed you choose (be it photos, music, games, etc. ), plus it presents even larger images and bigger advertisements. The new layout also serves to better highlight Pages users have liked in a more central and easier to access area, and provides info pulled in by services linked to folks’ Facebook IDs.The desktop FB site’s not the only beneficiary of the new layout, as the Social Network is also bringing these features to its mobile apps as well to provide a consistent experience across platforms. And, the best part is it starts rolling out today to a select few, with a wider rollout to follow once all the kinks have been worked out. Why the change? Well, Mark Zuckerberg said that the goal for News Feed is to “give everyone in the world the best personalized newspaper we can,” and making it more visually engaging will help Facebook reach that goal. You see, almost 50 percent of the content in News Feed is now photos, and almost 30 percent of content comes from Pages. Want to know more? There’s more info about the changes after the break. 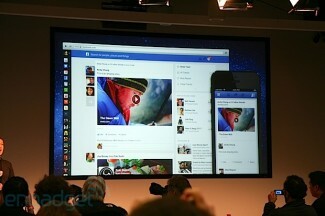 The redesigned News Feed was built with mobile in mind to ensure that the experience would be the same on PCs, tablets and phones. This forced the design team to simplify the look for it to be as flexible as needed. It now has a uniform menu tray that pops out from the left side that looks the same across all screen sizes, which allows users to navigate to any part of Facebook without needing to go back to the home page — meaning it’s easier than ever to get sucked down a rabbit hole of baby pictures, witty comments, likes and pokes. So, the real question is, with Facebook being an even more efficient time waster, what’s the toll going to be on worldwide productivity?